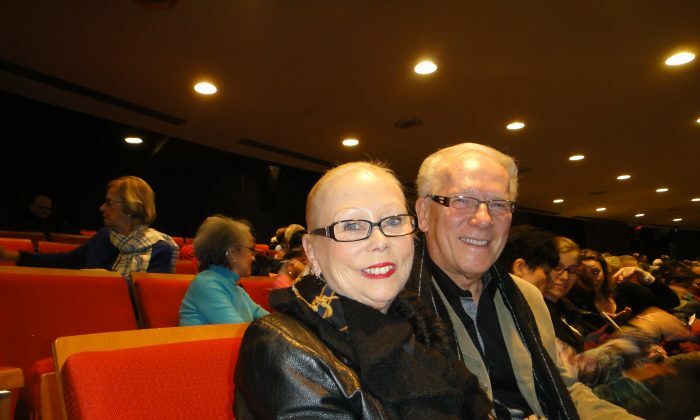 MONTREAL—Veteran dance teachers Francyne and Yvon Quintal took a break from their busy dance studio on Sunday, Jan. 11, to take in Shen Yun Performing Arts at Place des Arts. Combined, the couple has over 80 years of dance and teaching experience, and has been running the award-winning Yvon Quintal Centre for Dance for over three decades. Mr. and Mrs. Quintal had high praise for Shen Yun, a New York-based classical Chinese dance and music company with a mission to revive 5,000 years of divinely inspired Chinese culture. This ancient culture has been nearly destroyed by decades of communist rule in China. “It’s very, very professional and I enjoyed it a lot,” said Mr. Quintal, who specializes in ballroom dancing and judges national and international dancing competitions. Mrs. Quintal teaches classical ballet and studied with the Ballet Métropolitain du Canada and the Claire Duhamel Dance Studio. She was impressed with how synchronized and harmonized the dancers were. “The way they worked together was perfect,” she said. “They’re very together, very tight,” added Mr. Quintal. He also noted classical Chinese dance is highly expressive and creative with a lot of “artistic action and emotion.” Mrs. Quintal said the dancers had “a lot of grace” in their movements. Classical Chinese dance is one of the oldest systems in the world, according to the Shen Yun website. “Soaking up profound wisdom from every era and dynasty, it has become a complete system of dance embodying traditional aesthetic principles with its unique dance movements, rhythms, and inner meaning,” says the website. Mr. Quintal also appreciated the high-level choreography in Shen Yun, and noted it was a difficult to feat to accomplish given that the company puts on all-new performance each year. Formed in 2006 by overseas Chinese artists, Shen Yun has grown to four companies that simultaneously tour to top venues around the globe.